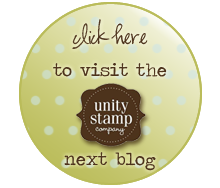 Hey my stampin' Peeps! Hope you are all having a fantabulous hip HOP! I'm so in love with this weeks theme......Thankful. You find me at a time in my life when there is truly so very much to be thankful for. Many of my close friends will be raising their eyebrows right about now....sorry....go with it....you can truly find blessings in even the most trying of times. ....do you see where I am going with this? I am so very thankful for all of the beautiful people in my life that are there for me in even the most trying of times. Some of those peeps are people you all know....Angela, Brookie, Kimber, Eryn, Michelle, ....I can keep on going. I am so very thankful for my 'family' within Unity. You have found them. You know how wonderful they are. I feel so blessed to have so many supportive, wonderful people in my corner in good times and in bad. I chose one of my favorite Unity sentiments....& Unity has so very many BEAUTIFUL sentiments to choose from....to create this one. The sentiment is perfect for me right now because, as we all know, 'into each life a little rain must fall'. I'm so very thankful for my friends who keep me sane and are there for me in the good times & bad. I truly do not know what I would do without them. This card is beautiful and love that sentiment too! I'm so grateful for my family and all the Unity/Ippity peeps. You all mean the world to me. Yes, Unity is an awesome family! We all know why you are thankful for them! I love your card! The flower with the sentiment for the center is adorable. Love love love all that stitching! This is sooooo lovely. All the detail, the stitching, just fabulous! Love everything that you did with the card! BEAUTIFUL!!!! The paper is amazing, the stitching is fabulous! LOVE IT ALL!! Great card and a sweet post. We all have so many folks to be thankful for! Welcome Back Jen! Love all your creations!! I am very grateful that i have found Unity!! Love all their stamps!! The people are the best!! So very lovely!! Love the dps, and the Unity stamp is perfect!! This is such a gorgeous card. I am with Karen, loving those papers big time! beautiful thoughts Jennifer - HUGS!!!! Your card is gorgeous too! encouraging to read about your positive and humble spirit even in trying circumstances. it is strengthening to know and appreciate life's beauty all around us each and every day. 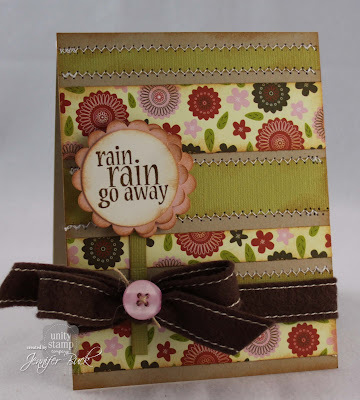 Gorgeous card - love the edges of your embellie, the DP, the stitching, and the distressing. Love your card Jen! I am happy you have this time with your Mom. I miss mine everyday. It's hard living so many states apart when we are so very close. I am thankful to have her as my mom that's for sure. Great card. Love the flowers and the stitching. Amen to being thankful for good friends! I'm glad that I've got my internet friends too!!! This is so pretty, Jennifer!! I love your sentiment flower, and the papers are so beautiful!! Love all of your stitching too!! Gorgeous!! You really know how to come back with a bang! Can't wait to see what you have for this week! !